“Good governance” is an obscure term prominent in IMF, World Bank, & UN literature about the management of neoliberalism, especially in the plundered countries. It’s an undefined term because it signifies absolutely nothing–unless baloney has recently acquired meaning. What the term hides is the indisputable reality that neoliberal austerity programs are most effectively operated by corrupt regimes. You cannot have neoliberal plunder in any country by multinational conglomerates without regimes on the take stealing the public coffers blind; without regimes that operate as crony capitalists dishing out government contracts & other perks to family & friends; without regimes willing to ignore laws or rewrite them to more accommodate plunder; without regimes willing to employ riot cops, military, & paramilitary if necessary, to enforce plunder. The IMF & World Bank likely budget graft & coruption right into their loan packages & consider it the price of doing business because the returns from plunder are so astronomical. It’s almost like getting something for nothing. Many protests around the world, including most currently in Brazil & Turkey, have focused on government corruption. 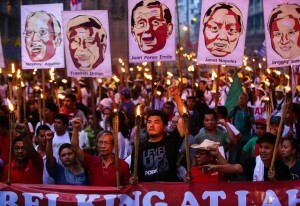 This protest yesterday in Manila, Philippines, is one of a series organized by the Scrap Pork Network, a broad coalition of organizations demanding an end to lump sum allocations from a government discretionary fund dispensed to politicians for pork barrel projects in their districts (small-scale infrastructure or community projects). The obvious possibilities for theft in such a program have been fully realized, engineered by Janet Lim Napoles, a long-time scam artist & close confidant of president Benigno Aquino, in collusion with several government officials, including Aquino. Napoles is called the “pork barrel scam queen,” a title she apparently wears without shame. In April, it was estimated that USD $240 million out of a cache of $300 million was siphoned off by Napoles & politicians. It cannot be said the Filipino government is being defrauded since they are the guilty parties; it is the Filipino people who are being ripped off wholesale. The same gang is involved in other lucrative scams, including heisting royalties from the plunder of natural resources. The protesters are demanding Aquino prosecute all officials, many of whom, like the pork barrel scam queen, are his friends.The banners held aloft here are the accused politicians & constitute a wall of shame. 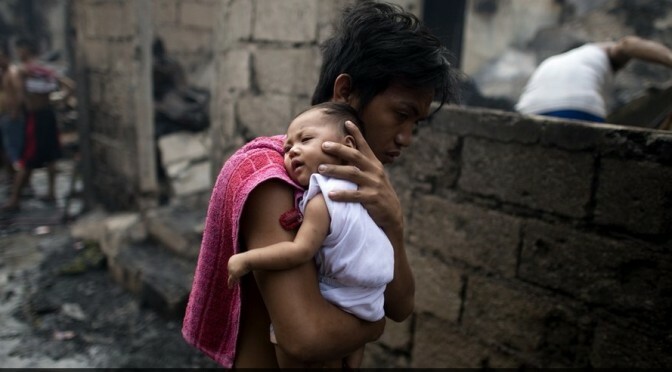 This is the human toll of urban gentrification/urban development mandated by IMF programs: a man & his child are headed to a basketball court turned into an evacuation center in the Tondo district of Manila, Philippines. In the fourth slum fire just in the past five weeks, thousands more were left homeless in an area targeted for development into swanky venues for the rich. The Philippine government is authorized to clear out tens of thousands of slum residents all over Manila by December 2015 so the land can be privatized to suit IMF mandates & used for gentrification schemes. 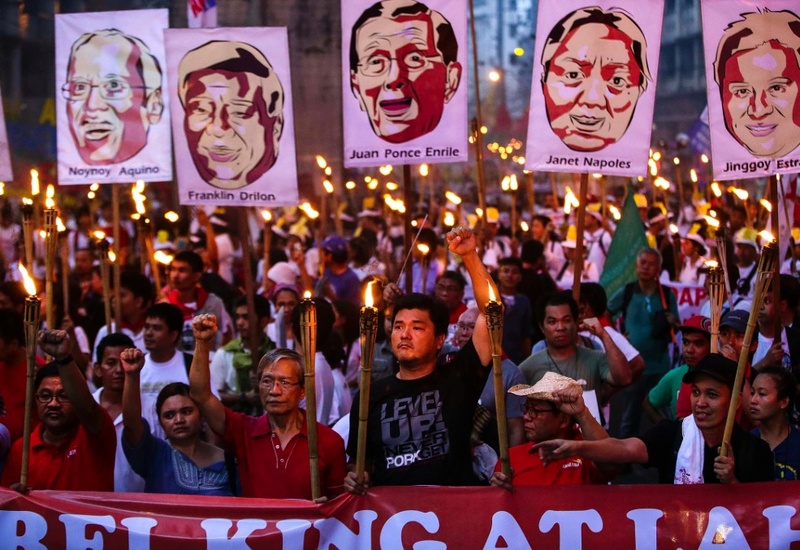 With no place else to go, residents are understandably resistant to being evicted, so it appears the Aquino regime is using the same method used in dozens of other cities & other countries: simply burning the shanties to the ground. Fire forensics are seldom reported but fire officials theorized this latest fire on March 24th was caused by an unattended electrical appliance which torched hundreds of homes made of makeshift, flammable materials. We only wish that were persuasive but it isn’t–at least not to residents. Arson motivated by greed is the more likely cause & the least likely to be investigated. The more important issue is why governments aren’t addressing the massive, global housing crisis which their policies, in league with IMF plunder programs, create for now over a billion impoverished people.